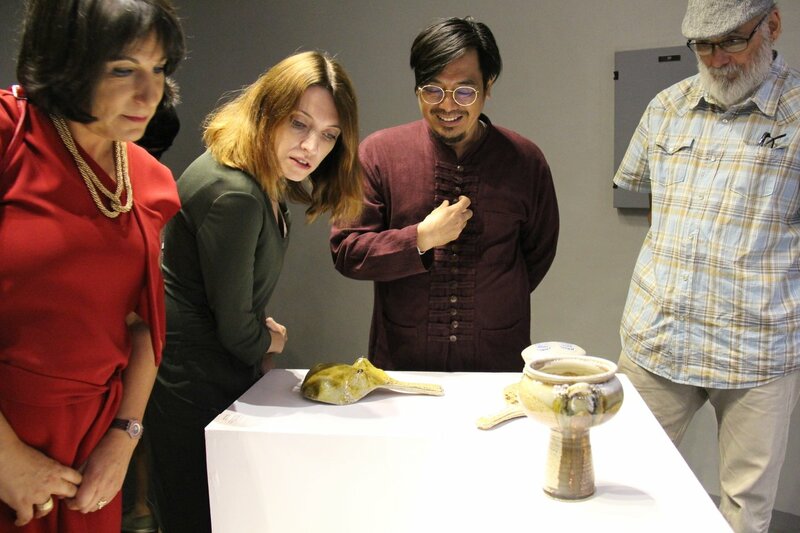 Guests from the art worlds of Israel and the Philippines flocked to the UP College of Fine Arts (UP CFA) Corredor Gallery in UP Diliman for the opening of “Common Ground: A Ceramic Art Collaboration Between Israel and the Philippines” on March 28, 2019. The exhibit was a culmination of a weeklong series of ceramic art-centered activities led by Israeli guest artist Roy Maayan, who gave a series of talks and workshops as a lead-up to the launch. Concepcion also congratulated the proponents of the launch, led by Maayan and the UP College of Fine Arts Ceramic Studio under Prof. Ma. Rita B. Gudiño, for building bridges that brought the two cultures closer. The same general sentiment of bringing cultures and peoples together through art was echoed by Israeli Ambassador to the Philippines H.E. Rafael Harpaz and UP College of Fine Arts Dean Leonardo Rosete in their own messages. The three guests of honor later led the ribbon cutting ceremonies that opened “Common Ground”. Starting on March 23, Maayan led Master classes, artist talks, and open studio sessions on creating ceramic art that were open to the public. These included sessions from forming, casting and decorating bisque fired artworks to soda finch kiln firing. These events are in line with the UP CFA Ceramic Studio’s plan to institute a multidisciplinary Ceramic Arts Program as a new minor in the College of Fine Arts that aims to widen the knowledge, skills, and conceptualization skills of students in the use of the medium. “Common Ground: A Ceramic Art Collaboration Between Israel and the Philippines” runs from March 29 to April 12, 2019.